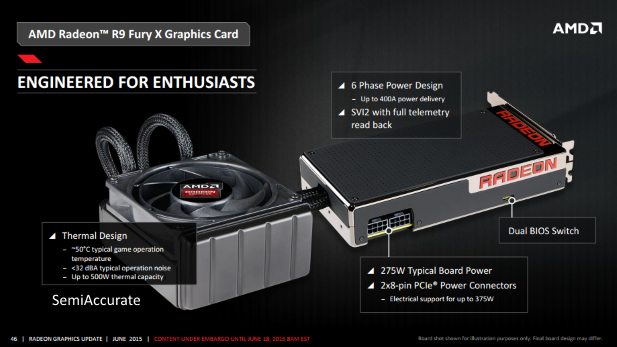 At AMD’s press event at E3 we heard a lot about AMD’s Fury X. One of the points they kept coming back to was the overclocking chops of this graphics card. It’s closed loop water cooler is rated for 500 Watts of heat dissipation, it has two PCI-E eight pin connectors for electrical power supply of up to 375 Watts, and its six phase power design can supply up to 400 Amps. It also has a dual BIOS switch to boot. All of these features give the impression that the Fury X should be a pretty good overclocker. So that’s what we did; we overclocked it and ran it through our benchmarking suite again so we could consider the performance benefit. We began our over clocking efforts by increasing the maximum fan speed to 100 percent and setting the power limit to 50 percent. We confirmed a stable overclock with five percent increase in core clock and then again with a ten percent increase. But when we went over a 10 percent core clock increase we ran head long into artifacting and the display driver crashed. Thus we came out with a maximum GPU clock setting of 10 percent. Given that the Fury X is clocked a 1050 Mhz by default this gives us an overclock of 105 Mhz for a final clock speed of 1155 Mhz. We then began working our now overclocked Fury X through our benchmarking suite when things got weird. Only one game showed a performance increase and all of the other games in our suite actually took performance hits. Our theory is that by raising the power limit to 50 we triggered PowerTune’s thermal throttling which caused the performance hit. So we lowered our power limit settings back to zero percent and retested our ten percent overclock. Then we consistently saw performance gains in all of the titles we tested. From there we built this graph of the impact of different power limit settings on the performance of our overclocked Fury X. As you can see performance trends downwards as we increase our power limit setting. We achieved the best performance with a five percent boost to the power limit setting. Thus our final overclocked settings are a ten percent core clock increase, a five percent power limit increase, and a 100 percent fan speed limit set through the AMD OverDrive panel in the catalyst control center. Here is the performance comparison between stock settings and our final overclocked configuration. With our ten percent overclock performance improved five percent on average over the stock Fury X. This is a decent if not particularly mind-blowing bump in performance. At this point in time there is no way boost the voltage which is what would be required to continue overclocking this GPU. Interestingly we played with the GPU Target temperature in slider in the catalyst control center we found that PowerTune will both down clock the Fury X and increase its fan speed to hit that target. Thus overclockers should shy away from playing with this setting because of its ability initiate throttling in addition to maxing out fan speeds. We also looked at overclocked performance in Mantle games. On paper the Fury X has all the traits of a good overclocker; but in practice at least some of that potential appears to be untapped. A more aggressive PowerTune scheme which considers fan speed, power draw, and thermal targets has left overclockers in a weird spot where you often have to work around PowerTune, rather than with it. If AMD gave users more control over or at very least more information about how PowerTune functioned on the Fury X it would go a long way towards remedying these frustrations. What good is an overclocked GPU if it’s throttling all the time? Additionally, the lack of anyway to overvolt our Fury X has limited our overclocking efforts even more than PowerTune’s somewhat unintuitive behavior. Overclocking requires three things: chips with headroom, useful and intuitive settings to tweak, and graphics cards designed to allow users to support those tweaks and access that headroom. With the Fury X AMD can only offer overclockers this last point, with the first point being a matter of opinion, and AMD’s current version of OverDrive being inadequate to meet the second point.